FFA - Judicial board rebukes Pennsylvania Judge Mark Martin for ruling that it was ok for a Muslim immigrant to physically attack and choke an American citizen because the Muslim was unaware that Sharia law did not apply in Pennsylvania. Judicial board rebukes Pennsylvania Judge Mark Martin for ruling that it was ok for a Muslim immigrant to physically attack and choke an American citizen because the Muslim was unaware that Sharia law did not apply in Pennsylvania. Judge Martin’s flawed ruling underscores the legal calamity that public officials are inflicting on the rights afforded us under the United States Constitution by recognizing Sharia law. This judge violated his oath of office to uphold and defend the United States Constitution by injecting provisions of foreign law into the public policy decisions of his court. Article updated July 31, 2012. Pennsylvania Judge Mark Martin ruled that it was ok for a Muslim immigrant to physically attack and choke an American citizen because the Muslim was unaware that Sharia law did not apply in Pennsylvania. The history and details are posted below. Florida Family Association responded by sending out email alerts in February and March titled Judge elevates Sharia law over US Constitution in Pennsylvania, rules Muslim immigrant ok to physically attack and choke American citizen who mocked Muhammed. Our email alerts encouraged supporters to send emails that called on the Commonwealth of Pennsylvania’s Judicial Conduct Board, Pennsylvania Governor, Pennsylvania Senate President and Pennsylvania Speaker of the House to remove Judge Martin. Florida Family Association supporters sent over 6,300 emails to each official. It appears that Florida Family Association supporters’ emails to the Commonwealth of Pennsylvania’s Judicial Conduct Board helped influence the board’s reprimand. A reprimand is certainly better than no disciplinary action at all. Hopefully, the thousands of emails sent by Florida Family Association supporters to Commonwealth of Pennsylvania’s Judicial Conduct Board, Pennsylvania Governor, Pennsylvania Senate President and Pennsylvania Speaker of the House communicated the message that Judge Martin’s elevation of Sharia law resulting in the obfuscation the United States Constitution was intolerable. Judge Martin’s flawed ruling underscores the legal calamity that public officials are inflicting on the rights afforded citizens under the United States Constitution by recognizing Sharia law. This judge violated his oath of office to uphold and defend the United States Constitution by injecting provisions of foreign law into the public policy decisions of his court. If a judge does not respect and honor his oath of office to defend and protect the United States Constitution he or she should be removed from office. Support legislation that prohibits courts from recognizing foreign laws including Islamic Sharia law. Confront public officials who violate their oath of office by embracing provisions of Sharia law that are inconsistent with American laws. Expose corporations that embrace or facilitate groups like CAIR (Council on American Islamic Relations) who support Sharia in America. Your participation in our email campaigns and support is important to our success. Article updated March 4, 2012. Florida Family Association sent out an email alert on February 27, 2012 which reported “Judge elevates Sharia law over US Constitution in Pennsylvania, rules Muslim immigrant ok to attack and choke American citizen who mocked Muhammed.” That email alert is posted below in its entirety. Sadly, Judge Martin blamed the good folks of America who are concerned about judicial trampling of their First Amendment Rights and injection of Sharia law into court rulings. Florida Family Association has prepared a NEW email for you to send to the Pennsylvania Speaker of the House of Representatives, Senate President, Governor, Attorney General and the Judicial Conduct Board of Pennsylvania calling for Judge Martin’s removal. Note: Florida Family Association did not repeat the inaccurate and retracted information which alleged that Judge Martin is Muslim even though the words he chose to speak during the hearing could have been and were misconstrued. First articled published February 27, 2012. Pennsylvania Judge Mark Martin ruled that it was ok for a Muslim immigrant to physically attack and choke an American citizen because the Muslim was unaware that Sharia law did not apply in Pennsylvania. 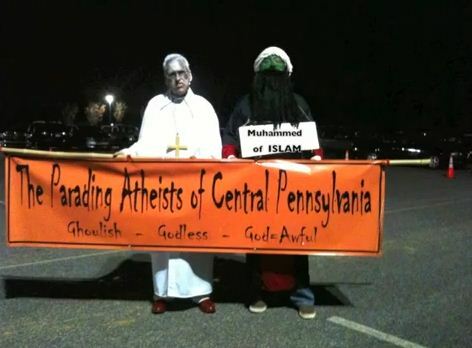 Muslim immigrant Talaag Elbayomy attacked Ernie Perce who was dressed up as a “Zombie Muhammed” when he represented the group called Atheists of Central Pennsylvania in the Mechanicsburg parade. Ernie Perce posted this Youtube.com video titled “Muslim attacks atheist.” He claims he was grabbed and choked as Elbayomy tried to yank his "Muhammed of Islam" sign off of his costume. Perce’s friend who accompanied him as the "Zombie Pope" was not attacked. Talaag Elbayomy argued that he was obligated to respond to Perce’s offensive mocking of the prophet Muhammed. Elbayomy said that if anyone committed a crime (against Islamist commands, Sharia) it was Perce. “Elbayomy reportedly admitted to a police officer, Sgt. Bryan Curtis, that he attempted to rip Perce’s fake beard off, remove his ‘Muhammed of Islam’ sign and choke him.” According to Pamela Geller’s article in the Daily Caller. Judge Martin dismissed the case against Elbayomy saying it was Perce’s word against Elbayomy’s even though the defendant admitted to accosting Perce and the attack was captured on video. Judge Martin said that Perce strayed "way outside" First Amendment protections. "I think you misinterpreted things. Before you start mocking someone else's religion you may want to find out a little bit more about it it makes you look like a doofus and Mr. (Defendant) is correct. In many Arabic speaking countries something like this is definitely against the law there. In their society in fact it can be punishable by death and it frequently is in their society." More of a transcript of the court proceedings is posted below. Judge Martin railed victim Ernie Perce for six minutes for being so insensitive toward Muslims as to dress in a costume that mocked Muhammed at a parade. Click here to see Youtube.com video of the court hearing. Click here to see news report on ABC 27 TV. How many times have citizens been told by the court that ignorance of the law is no excuse? But not so in Judge Martin’s court where Sharia law from foreign countries takes precedence over American laws in Pennsylvania. Judge Mark Martin’s statements and ruling in effect declared in an American court that Muslim immigrants may use Sharia law as a legal defense to attack American citizens who mock their faith and that ignorance of American law is an excuse for Muslim immigrants who violate state law. Victim Ernie Perce claims that he has received over 500 death threats. No wonder now that an American judge has ruled that Sharia law is legitimate legal grounds for attacking people who mock Muhammed. How many of these death threats are coming from American Muslims who now believe the ruling applies to them as well? Judge Martin, who obviously holds such strong beliefs that are contrary to the United States Constitution, should have recused himself. However, he did not recuse himself. Instead, he judicially injected his personal bias in a manner that created an injustice for the victim and harmed the public policy of the American people. Advocating attacks on non-believers that could even result in death is the worst and most extreme command over Sharia minded followers. The Court of Judicial Discipline of the Common Wealth of Pennsylvania states regarding removal of a judicial officer “The Pennsylvania Constitution has always provided for the removal of public officials, including judicial officers, through the process of impeachment and trial of impeachment. That process vests in the House of Representatives the sole power to impeach, and requires the Senate to conduct a trial of the impeachment. Article VI, §5 of the Constitution requires the concurrence of at least two-thirds of the Senate members "present" to convict an impeached public official.” Click here to read entire article. Please send your email calling for Judge Martin’s removal from office. Florida Family Association agrees so strongly with Mr. Turley and many others that Judge Mark Martin should be removed from the bench that we have prepared an email for you to send to Pennsylvania Speaker of the House of Representatives, Senate President, Governor, Attorney General and the Judicial Conduct Board of Pennsylvania calling for Judge Martin’s removal. FACEBOOK. We added the Facebook Like key so that you can share this article with friends. Simply click the FLike key at the top of this page. The article will post to the top of your Facebook WALL page. Click on the SHARE or RESHARE link for that article in your Wall page to share with friends. National Review article titled The Sharia Court of Pennsylvania — the Transcript. Some of the transcript from the court hearing. Well, having had the benefit of having spent over two-and-a-half years in a predominantly Muslim country, I think I know a little bit about the faith of Islam. In fact, I have a copy of the Koran here, and I would challenge you, sir, to show me where it says in the Koran that Mohammed arose and walked among the dead. [Unintelligible.] You misinterpreted things. Before you start mocking someone else’s religion you may want to find out a little bit more about it. That makes you look like a doofus. And Mr. Thomas [Elbayomi's defense lawyer] is correct. In many other Muslim speaking countries – excuse me, in many Arabic speaking countries – call it “Muslim” – something like this is definitely against the law there. In their society, in fact, it could be punishable by death, and it frequently is, in their society. Here in our society, we have a constitution that gives us many rights, specifically, First Amendment rights. It’s unfortunate that some people use the First Amendment to deliberately provoke others. I don’t think that’s what our forefathers really intended. I think our forefathers intended that we use the First Amendment so that we can speak our mind, not to piss off other people and other cultures, which is what you did. I don’t think you’re aware, sir, there’s a big difference between how Americans practice Christianity – uh, I understand you’re an atheist. But, see, Islam is not just a religion, it’s their culture, their culture. It’s their very essence, their very being. They pray five times a day towards Mecca. To be a good Muslim, before you die, you have to make a pilgrimage to Mecca unless you are otherwise told you cannot because you are too ill, too elderly, whatever. But you must make the attempt. Their greetings, “Salaam alaikum,” “Alaikum wa-salaam,” “May God be with you.” Whenever — it is very common — their language, when they’re speaking to each other, it’s very common for them to say, uh, “Allah willing, this will happen.” It is — they are so immersed in it.